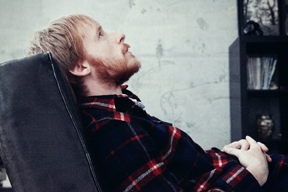 As Kevin Devine started work on his sixth solo album, Between the Concrete & Clouds, he decided to make some fundamental changes. The first notable difference was the way he structured his day when he woke up each morning. Having spent most of his time on the road during the last few years, he needed some adjustment when he was stationary, at home in Brooklyn. And this marked the second big change for the New York City-born singer and songwriter. Rather than starting his process with a tight focus on the words, he allowed himself to follow “the things you unconsciously stumble upon—almost like the lyrics are a color more than a narrative.” Not, of course, that it meant any less of a commitment to that element of his writing. This focus on musicality and succinctness indicated yet another new direction for Between the Concrete & Clouds. “I grew up listening to Weezer and the Cars as much as to Nirvana and Bob Dylan,” says Devine, “and on tour we were listening to a lot of Kinks and Zombies records.” His recent touring partners Nada Surf helped him reconnect with the power-pop side of his personality, which came straight to the surface in the new batch of songs.